The term "Dinovember" has only been around since 2012, and the idea of toys having a secret life of their own while we sleep or are out of the house, is one of my favorite themes. During Dinovember, parents are encouraged to convince their kids that their toy dinosaurs come to life while they sleep! 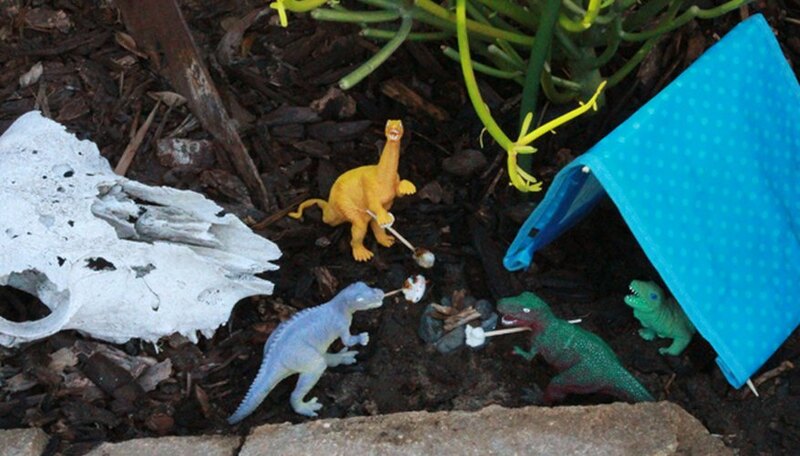 Setting up a variety of scenarios where plastic toy dinosaurs are frozen, mid-activity throughout the month of November (hence, "DiNovember") makes my heart skip a beat. I hope you enjoy these dinosaur scenarios I've come up with. Each one has a small, hand-crafted element within it, and takes only a few props to set up. Around the first of November, plant a few seeds that will germinate quickly (radishes are a good bet) or pluck off the tiniest sprigs of mint to make a crop row or two within a terra cotta pot. Use bamboo cocktail forks as plant markers. 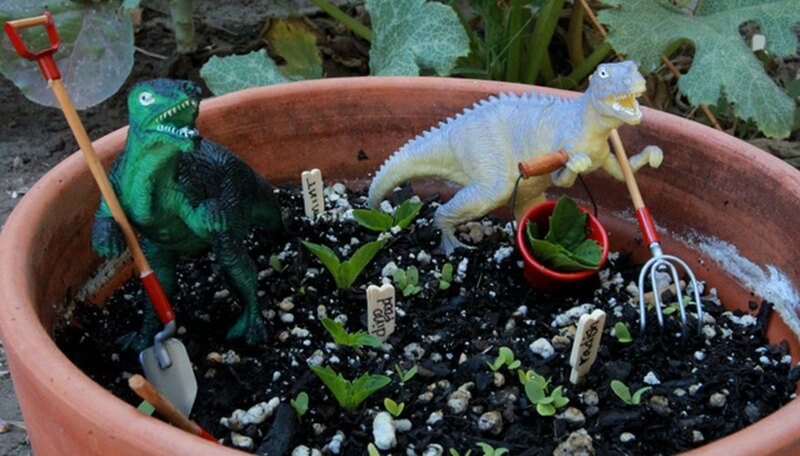 I used dollhouse gardening tools, but you can buy miniature pots and baskets at almost every craft store, or fashion your own garden hoe out of a bamboo skewer and foil. 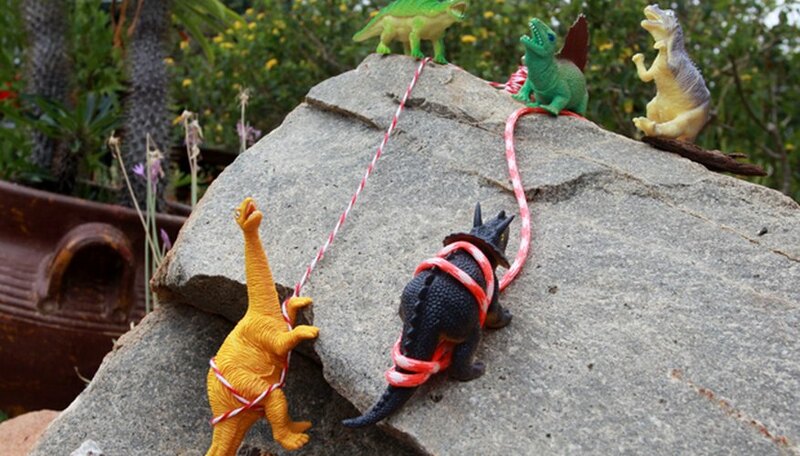 With a little survival cordage and your backyard rocks you can have a fun day of T-reX-treme sports! Tie the cordage (or, colorful kitchen twine!) around a couple of daring dinosaurs to look like they are in a harness and lower them down a rock. Leave a few friends at the top of the mountain to "spot" their pals, and cheer them on as they rappel. 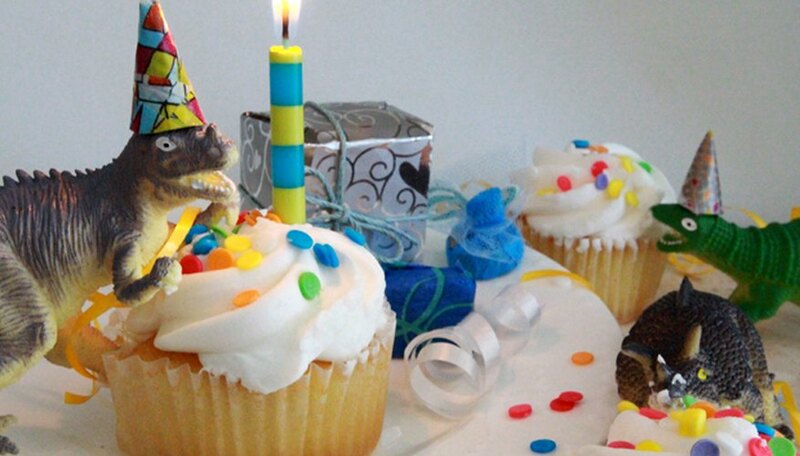 In the kitchen, cut a cupcake down, or leave it as is and let the dinosaurs ravage it. Wrap tiny boxes (cardboard jewelry boxes or mint tins work great). Wrapping ribbon makes great streamers, and Washi tape is a very handy way to decorate scrap paper to look like mini party hats. Deconstruct the tailor-made baby shower card from Papyrus (the one with all the miniature baby booties on it!) and glass head pins (jammed through the plastic hands of the dinosaurs) to make it look like a serious knitting party has taken place! 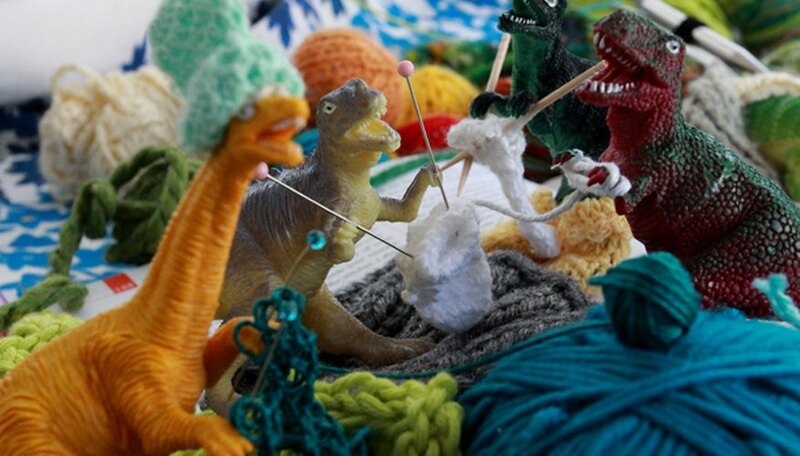 If some dinosaurs opt for the bamboo knitting needles, use fancy tooth picks and earthquake putty to hold them in place. Also, scatter scraps of knitting, balls of yarn and a few knitting books around your favorite craft nook to add some authenticity. Make a fire ring with hot glue and pebbles. Fashion a tent with a fabric scrap ( I used a re-usable grocery bag with a large puncture wound that was headed for the trash, a few bamboo skewers and tape.) Cut up and skewer marshmallows with toothpicks. You can even toast them over a match, then Super glue them into the tiny little dino-hands. Use copy paper, scissors, staples, colored pencils, and your creativity to make a miniature version of your child's favorite book. 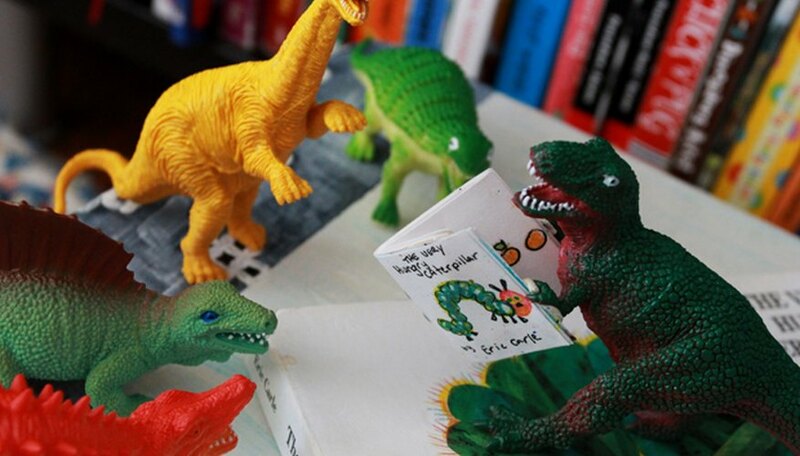 Select one reader to hold the book (with putty), while the rest of the dinosaur gang listens in a semi-circle. Your child's library or reading chair is a great location for this. Tip: Choose a book with 20 pages or less so that making a small version doesn't become a daunting task. Grab the popsicle sticks, a Sharpie, your glue gun, and an old tea box to make a quick tree house for the gang to hang out in. Place the treehouse in a houseplant, or your little one's favorite climbing tree. 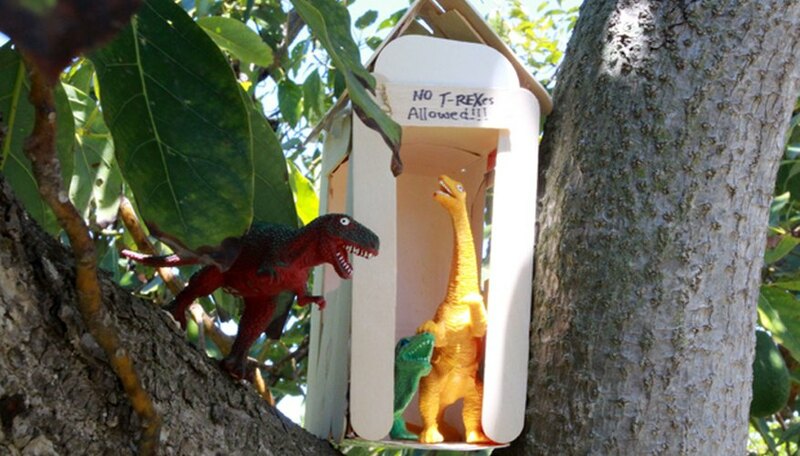 Add a rope ladder (optional) and sign (no T-Rexes allowed) if your dinosaurs are the type who don't play well with others. If you have a "road rug," set up two of your children's race cars with a dino-driver in each. (No sweat if you don't have the fancy rug, it's just as cute on a plain old floor.) Put one dinosaur in the middle of the cars holding a checkered flag. (Draw checkerboards on a white Avery label, fold it in half over a toothpick, and stick it in your dino's hand with super glue or Earthquake putty.) I added some Sharpie eyelashes and lipstick, and a scarf from a scrap of fabric as a nod to the lovely ladies who used to kick off drag races back in the 50's. 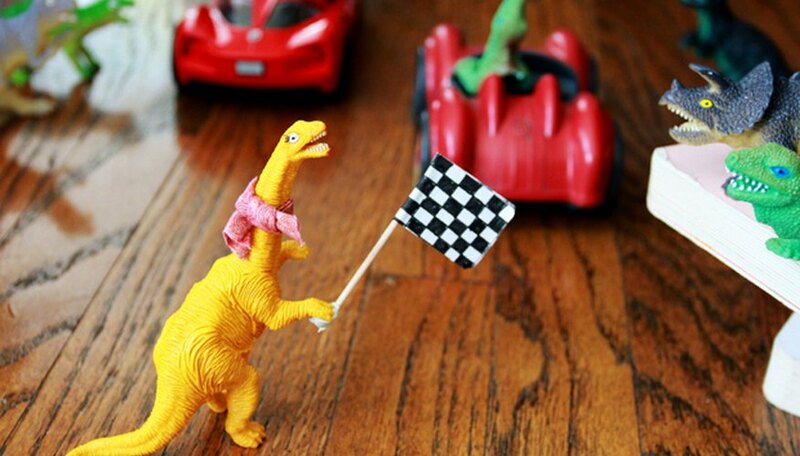 Use a handful of dinosaurs on the sidelines to cheer on the drivers. Cut old, stained kitchen towels into dinosaur-sized beach towels. 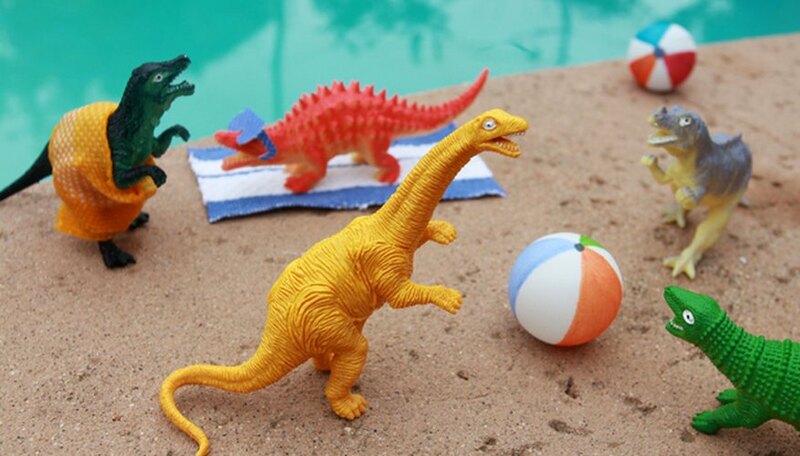 Use a permanent marker on ping pong balls to make them look like beach balls, and set up the toy dinos by the pool to enjoy one last splash before it gets too cold! Sunglasses cut from card-stock make a cute addition as well. Have an aquarium? Submerge a dinosaur in the aquarium and use a drinking straw and small spice or baby food jar to create a SCUBA helmet. 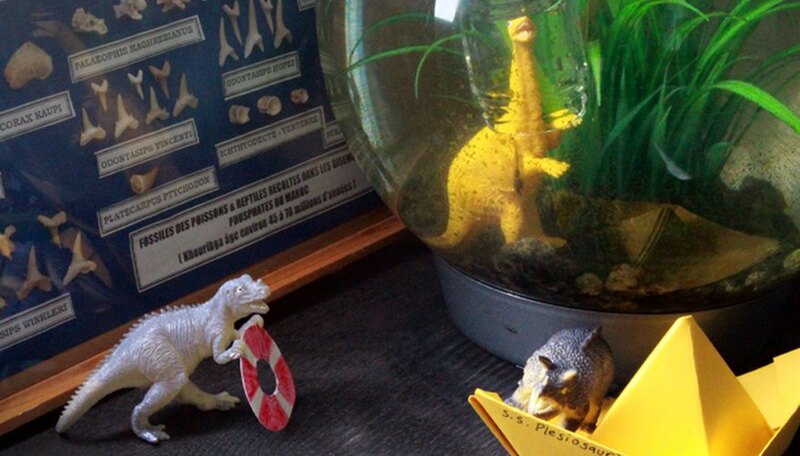 Tip: If your dinosaurs are hollow, cut a slit into the dino-diver to allow him to fill with water and sink. One quick google search later and you can make your own origami boat to add to the nautical theme. A helpful friend with a paper, crayon-colored life preserver can be waiting just outside of the aquarium.